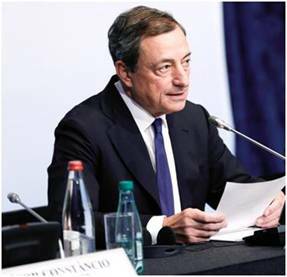 (Kitco News) - The European Central Bank has become a little bit more optimistic about the eurozone’s economic growth as it prepares to start purchasing government bonds March 9. As announced in January, the central bank will purchase €60 billion in government and private sector securities until, at least, September 2016. During the press conference, following the monetary policy meeting, ECB President Mario Draghi presented updated staff projections. The central bank now expects eurozone GDP to increase by 1.5% this year, up from December’s forecast of 1.0%. Economic growth is also expected to expand by 1.9% in 2016, up from the previous forecast of 1.5%, and for 2017 the central bank expects to see growth of 2.1%. “Looking ahead, we expect the economic recovery to broaden and strengthen gradually,” said Draghi in his opening remarks. During the question and answer period, he added, that the benefits of the central bank’s accommodative policies are being passed through to the general economy. Draghi also added that they expect lower oil prices to continue to support domestic disposable income and corporate profitability. Looking at inflation, the ECB said it expects to see more downward pressures this year and a gradual rise over the next two years. According to estimates, the ECB said the Harmonized Index of Consumer Prices (HICP) is expected to fall to zero percent in 2015, down from 0.7% forecasted in December. For 2016, inflation is expected to tick up to 1.5%, compared to the precious forecast of 1.3%, and inflation in 2017 is expected to hit 1.8%. Before the press conference the central bank said that it left interest rates unchanged with the main refinancing operation remains at 0.05%, its marginal lending facility rate stands at 0.30% and its deposit facility remains at negative 0.20%.